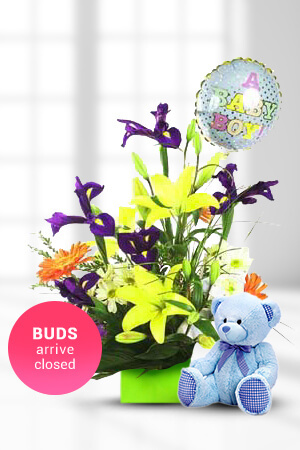 For the new mum with a beautiful baby boy this boxed arrangement with purple Iris, yellow Asiatic Lilies, orange Gerberas, light yellow Chrysanthemums, Spear Grass, Fern, Palm Leaf and other green foliage is a wonderful way to say congratulations. 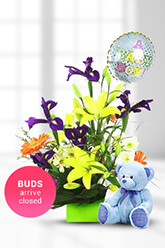 Complete with a cuddly Beanie Bear and a "Baby Boy" balloon, it says it all.Lilies may be sent closed/partially closed in order to prevent damage and to last longer.For a lasting impression and the ultimate congratulations, we suggest a bottle of Moet and Chandon to complete this stunning gift. The webpage is very user friendly, flowers delivered as per instruction. Service wonderful,beautiful flowers arrived same day and recipient thrilled with the arrangement.Thanks zFlowers.com I will definitely use your service again. Great choice of flowers, easy selection and order process, fair prices, efficient and reliable delivery. Thank you.